← BeatSkillz That Thing for Only $9 !!! 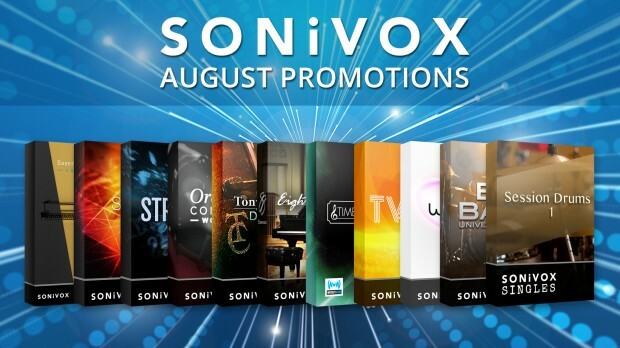 Our friends at Sonivox have some great offers for your today and through August 31, 2018. Get free copies of Eighty Eight Ensemble, TimeWARP2600, Twist and Wobble, Big Bang Universal Drums, or Free Session Drums with select purchases. See the news below for more info on these deals, at the DontCrack Store. This entry was posted in DontCrack, Promotions, Virtual Instruments and tagged Arp2600, Big Bang Universal Drums, dums, Eighty Eight Ensemble, Ensemble, Essential Keyboard Collection, Film, Film Score Companion, Free, Free Session Drums, Keyboard, orchestra, Piano, Promo, Solina Redux, SONiVOX, Synth, Tony Coleman Drums, Twist, Wobble. Bookmark the permalink.